The Esplanade is a seafront promenade bordering an open field where festival and events are often held. The Esplanade is not just a popular tourist attraction in Penang but also a historic place that tells you everything about Penang, including the history of how Penang transformed from a swampy frontier, to a bustling trading post, to the present day modern city. The Esplanade is located within the core zone of the George Town Unesco World Heritage Site. Because of its inscription into the Unesco’s prestigious World Heritage listing, the Esplanade is well preserved and maintained for its historical and cultural values. Within the Esplanade, there are a few historic buildings within walking distance that are worth visiting. These valuable architectures represent the various ethnicity that had settled in the city for the past two hundred years. They are a testament to the vitality of peace and multi-culturalism that are waiting for you to discover. Fort Cornwallis was built by Francis Light immediately after his landing on the island, with the present star-shaped structure completed in early 19th century. 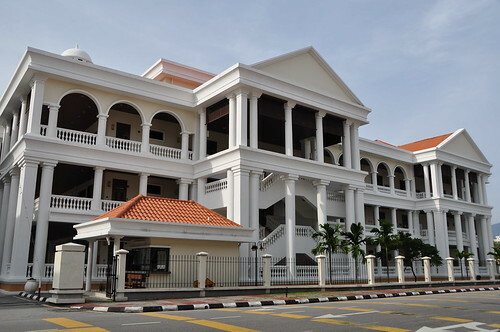 It served as the administrative centre of the island, housing the Supreme Court of Penang and laterthe Sikh Police force before its present role as a tourist attraction. Visiting Hours: 9am – 6pm daily (Sunday closed). Canon at the Fort Cornwallis. The Penang War Memorial was dedicated to the brave soldiers who sacrificed themselves over a surprised German naval attack on Allied vessels off the harbor of Penang during the first World War. The War Cenotaph or War Memorial at the Esplanade. The center of attraction at Esplanade is the Penang City Hall. The City Hall is a majestic colonial building built in 1880. The style of the Penang City Hall typifies the impressive Victorian architecture seen in many of Malaysia’s building during that period. Today the Municipal Council of Penang regularly uses the chamber within the City Hall for meetings. The City Hall was gazette on 29 July 1982, under the Antiquities Act 68/1976, as an Ancient Monument and Historic Site. Sadly, visitors are not allowed to enter the building. I wonder how the building looks internally. If you personally know the Minister of Penang, you might be able to get a pass to enter this impressive building and don’t forget to invite me too! The majestic Penang City Hall located at the Esplanade. The Penang Town Hall was once the center of the Penang socialite. 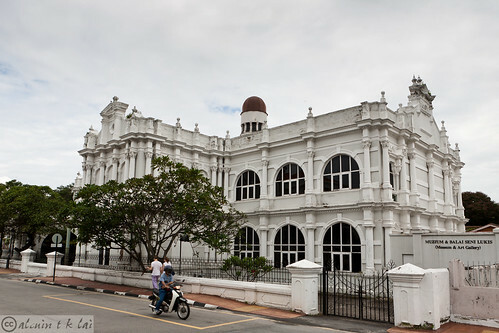 Declared opened in 1880 by Governor Sir Fedderick Weld, the Victorian architecture was used for various purposes, including theatrical performances, church services and the birth of the Penang State Library. 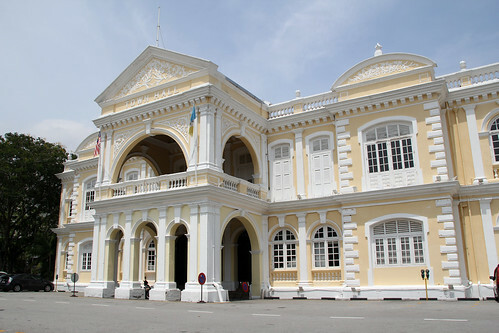 The Victorian style Penang Town Hall. 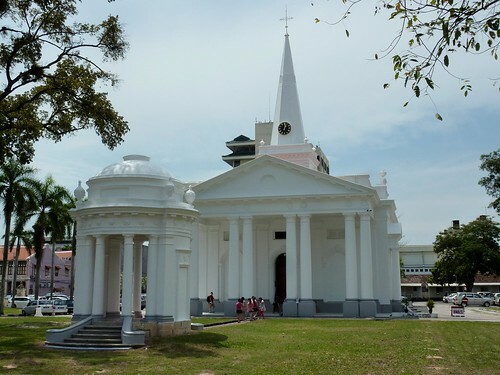 St. George’s Anglican Church is another congregation that is as old as Penang. Completed in 1818 after the neo-Palladian Georgian style, the church has come to be a symbol of religious harmony in Penang, coexisting with other religious edifices along the intersecting Jalan Masjid Kapitan Keling. The St. George’s Church nearby the Esplanade. Penang Supreme Court Building is another magnificent neo-Palladian architecture built in 1809 on a land plot that intersects Lebuh Light, Jalan Masjid Kapitan Keling and Lebuh Farquhar. 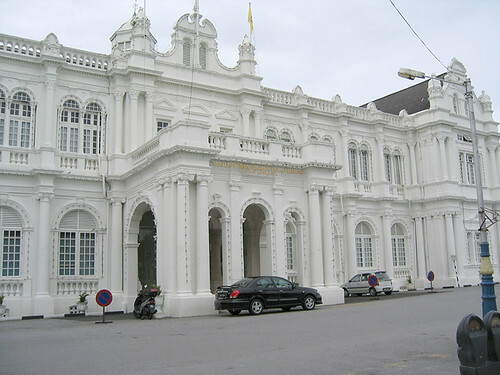 It currently houses the Penang High Court. 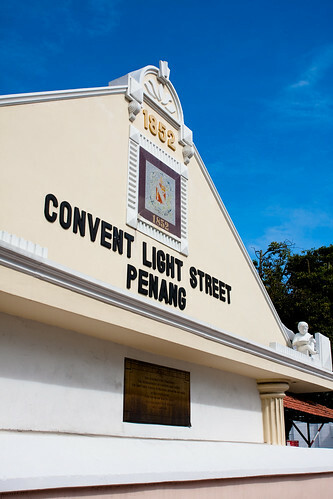 Convent Light Street School is the oldest girl school in Malaysia, of which the present location, once the Penang Governor’s residence, was acquired in 1859 to house the school, which functioned as an orphanage at one time. The Convent Light Street Penang. 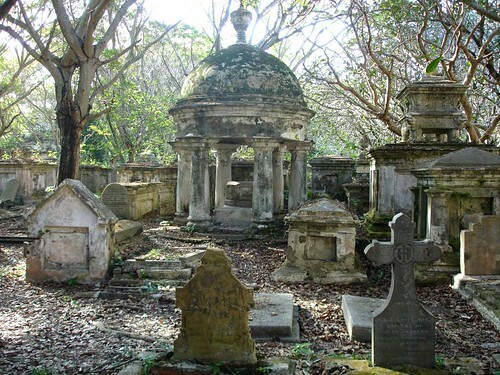 The Christian Cemetery, under the overarching shades of fragipani trees, is the final resting place of many pioneer of the island, such as Francis Light, James Scott, the founder of the Penang Free School Reverend Hutchings, Reverend Thomas Beighton of the London Missionary Society and etc. The Christian Cemetery is located at Jalan Sultan Ahmad Shah and it’s about 1km walking distance from the Esplanade. The place is a little creepy as it always looks gloomy even during the day. Some of the cemeteries probably already existed when the island was founded. The creepy Christian Cemetery in Penang. Penang State Museum, built in 1816, holds a distinguished history of being the home of the Penang Free School and the Hutchings School. In the Second World War, the building suffered bombings by enemy and Allied forces and the entire east wing was razed. It was set for demolition in 1961 as the State Government wanted to build a new school. 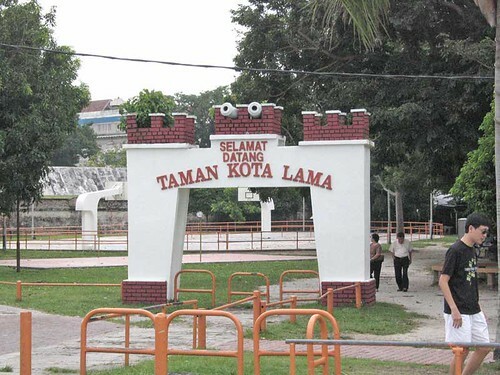 The plan changed, thanks to the first Malaysian Prime Minister Tunku Abdul Rahman Putra Al-Haj, who suggested the building be turned into a museum instead. Today, the Penang State Museum’s main objective is to collect, study, preserve and showcase the state and cultural heritage by promoting the educational exhibits of history and heritage and culture. Visiting Hours: 9am to 5pm daily except Friday. The historical Penang State Museum. Esplanade is a very famous place in Penang island. Sadly, although I have been in Penang Island for nearly 2 years, I haven’t really paid a thorough visit to Esplanade. I mean I have been to this place but it’s just that my visits had always been in a hurry and because of that, I didn’t manage to explore the place in depth. Anyway, during a peaceful weekend, the urge to go to this place suddenly came and without a second thought, I drove over there and decided to take some time off my precious weekend to treat myself to a very nice tour at Esplanade. The Esplanade is actually the stretch of waterfront at the Padang Kota Lama (a field) at Lebuh Light. The place was very popular in the early days and it was actually a rather romantic place back then. On the fifteenth night of every Chinese New year back then, called Chap Goh Meh, when the moon was full, the Straits Chinese would gather at the Esplanade. The highlight of the occasion was a procession of Nyonya maidens who were mostly cloistered in their home at other times. Therefore, this was the only opportunity for young men to view the girls, and then to make inquiries that might lead to marriages. The girls would alight from their carriages or cars to throw oranges into the sea, wishing for a good match. Fortunately, this traditional practice is no longer being followed now due to the fact that girls nowadays are no longer confined in their homes. Men don’t really have to wait till this day to find their lovers. But it was fun just to imagine the way the Straights Chinese court girls back in the old days. I can’t imagine if I would have to do this now. Today the Esplanade is pretty much modernized with the stretch of waterfront renovated with paved walkway and lots of benches for visitors to enjoy the cooling sea breeze. There is also an open food court and frequently, functions, parades and procession are being held here because there is a big field here. In addition, there is small monument, called the War Cenotaph or War Memorial, stands majestically here as a memorial to the victims of World War I. I wonder what really determines the structure of the Cenotaph. Other than the Penang City Hall, another historic site, Fort Cornwallis, is also situated nearby. This is another place which is worth visiting in Penang. All these tourist attractions are located within walking distance. Therefore, you don’t have to worry about transportation issue. For people who are driving, there are plenty of parking spaces at the Esplanade and you just have to pay 80 cents for one hour parking duration. Suggested time of visit is either early in the morning or evening at around 4pm onwards as the place can get very hot from 11am onwards to 4pm which is a typical tropical weather pattern. For more pictures of Esplanade, please visit the following flickr photostream.